Meringue kisses are delicate cookies with sweet, feathery outsides and a rich chocolate kiss in the middle. When they are eaten warm, the chocolate and delicate outsides dissolve into a sublime swirl of warm perfection. Before you know it, you’ll have eaten every last one. Creamy marshmallow frosting and frothy chocolate ganache topped with melting dark chocolate swirls and fudge make for a dessert that is nothing if not decadent. And if somehow it’s found lacking, add brownie squares and heath crunch. If you’re looking for elegance this Christmas, red velvet cheesecake is the classy and delectable choice. The color contrast between the red cake, pure white frosting, dark graham crust, and perhaps a mint leaf to top gives it a professional feel that is sure to impress. A staple in many households for the holidays, the comforting cinnamon-and-nutmeg smell of these cookies invokes all that is Christmas. Though easy enough to make Christmas morning before heading off to see the relatives, the cookies are appreciated by grandmothers and toddlers alike. Often similar to a cinnamon roll, rugelach is another anticipated favorite for Jewish holidays. Though cream cheese is an important ingredient in these pastries, the name invokes plump raisins, dripping brown sugar, and above all cinnamon more than any kind of cheese. Senior Isabel Lisle says that her dad visits a bakery to buy pastrami and rugelach after his work conferences. “Chocolate rugelach has powdered sugar on the top and is a little crunchy on the outside, but when you bite into it it’s a burst of chocolate-y flavor. Sometimes I’ll have it for breakfast if I’m feeling adventurous,” she said. A fun and easy treat that is as fun to make as it is to eat, chocolate dreidels are dreidel-shaped marshmallows with pretzel knobs dipped in silky melted chocolate and left in the refrigerator to cool. For decorative purposes, pipe white chocolate Hebrew letters on the smooth chocolate surface after the dreidels are cooled. Kaju katli, or cashew fudge, is a traditional Indian treat made with milk thickened with sugar, dried fruit, saffron, and other mild spices. It is usually cut into rhombi that shine with edible silver coverings and served in an elegant star shape. Those who celebrate Diwali and other Indian holidays enjoy malpua, which is not unlike fluffy, petite pancakes. 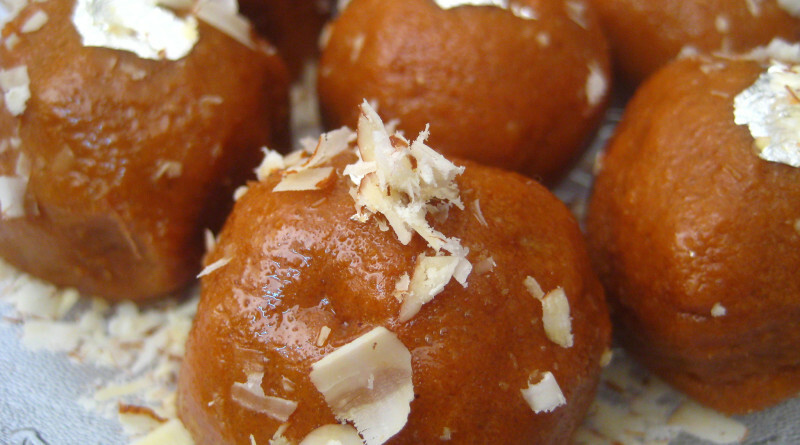 It is prepared by frying a smooth batter comprised of milk, flour, and cardamom seeds, as well as occasionally a banana, coconut, or pineapple.